It can’t beam me up. Yet. Everything I did via jailbreak on my iPhone is done natively on the Evo. If I buy an iPhone 4 now, I’m going to be kicking myself when the iPhone 5 (or iPhone 4S) is announced in April, or May, or whenever His Steveness decides it’s time to drum up media support again. My company offered a pretty deep discount on accessories and plans if I chose the Evo over, say, the Droid or iPhone. I’m pretty happy with my purchase. My phone does… well… almost everything a Star Trek communicator* can do. And more besides. Communicator: Calls the ship, or other people in the landing party, at the touch of a button. Just say what you want. With the appropriate relays (ships, subspace substations, etc), you can call anyone. However, if you really want to talk to someone on Dytallix-B, you have to be on the ship and using a more powerful comm system. Evo: Calls anyone I want. I can use voice-dial if I really want to, but I don’t. I still type in the phone numbers or pick people off the contact list. But I can call anyone in the world (since we haven’t gotten to the rest of the galaxy yet, I’m going with world here) via direct-dial, as long as I’m willing to pay roaming charges. Communicator: Attached to a Starfleet Officer’s shirt, a commbadge can be easily removed or even knocked away. They’re relatively hard to destroy just by dropping or stomping upon, but you can certainly lose it pretty easily. At least you can just get a new one from ship’s stores without having to worry about your contract, or who your carrier is. Evo: If I drop the Evo, it’ll probably break (I have a case, but it’s not a hard case; it just protects the glass screen and camera). If I stomp on the Evo, it’ll probably break. But unless I’m really careless, it won’t fall out of my pocket or get lost if a giant alien throws me through the wall. Plus, no one knows I have it unless it rings in my pocket. Communicator: The only sounds it makes are: nothing (when it’s dead), a repeated busy-signal-like bipping when it’s jammed, or the high-pitched squiggly noise of a connection being opened. I’m not sure how to change the ringtones, or how to set it on silent, and if your mom calls while you’re in the middle of delicate treaty negotiations to ask if you can pick up some more Astro-roid Cream, there’s no ignore function. Evo: Unlimited (except by SD card space) ringtones and messaging tones, an ignore button, easily drops to silent mode, and voicemail. Plus, if an agent of the Tal Shiar is approaching, you can hide it and set it on silent with a couple of touches. Or call for someone to beam you up. Either way. Communicator: I don’t think they have Facebook, Twitter, or Foursquare in the 24th Century, but maybe it’s just because communicators can’t handle text updates. You could use your tricorder, but who wants to carry around multiple devices? And texting? Sometimes Ensign D’Sora doesn’t need to call Worf to tell him that the new torpedo launcher is ready, but if Worf wants to get the message she keyed into the console, he can’t do it on his commbadge, now can he? Evo: If there’s a form of texting or social communication that this thing can’t do, I haven’t found it yet. And when my wife texts to let me know she’s ten minutes away, so put on my shoes and we’ll go out to eat, I don’t have to log into my computer to get the message. Communicator: Okay, look, I know it’s part of a uniform and you really don’t get a choice (unless you’re Captain Picard and you like wearing a gray shirt with a red jacket). But if you want an official Starfleet communicator, it has to look like everyone else’s. Sounds kind of iPhone-y, doesn’t it? Evo: While all Evos also look the same, there’s a myriad of cases you can use to personalize the device. You can also change the wallpaper, install any apps you like, and even reprogram the device to behave in ways the creators certainly didn’t intend. Even if your company says “welcome aboard. Here’s an Evo. It’s your official work phone,” you can still go to Amazon or wherever and buy a cool case, or an extended battery, or one of those little cellphone fob thingies, or a Bluetooth headset. Communicator: That little thing’s got a pretty powerful speaker on it, and you can’t really adjust the volume (unless there’s a dial I’m not seeing, or a voice command no one’s used). When you’re on it, everyone knows you’re on it. At least it’s not a Zach Morris communicator (which is probably so big you have to strap it to your chest with a harness). Evo: Incoming calls are heard through the device, or a headset of your choosing. It also has a fairly loud speakerphone, but you don’t have to use it to take calls. Communicator: Pretty much infinite, as far as I know. I’ve never seen one die due to lack of battery power. Evo: Mine runs out by 2pm. I have chargers everywhere, and a few spare batteries. If I want a stronger battery, I have to buy one. Communicator: None. Well, except for voice commands, but I think you have to tell your shuttlecraft that you want to use voice control beforehand. You can’t take pictures or video, you can’t use it as a GPS, you can’t scan for life-forms or see what other holoplays K’Chargan Son Of Krimazon has been in. You can translate any language in the universal translator’s language banks, which is a pretty big selling point… but most people don’t even leave the ship or the starbase. I mean, sure, Ensign Ricky in Maintenance has a communicator too, but how many away teams does Commander Riker invite him on? Evo: The Evo does everything a 21st-century cell phone should be able to do, and the apps are limitless — if a programmer can code it, it can be done. Plus, Google has an on-the-fly translator app that handles pictures; it’s only a matter of time until they have one for audio as well. Communicator: Nope. Where would you point it, anyway? I’m pretty sure a tricorder can do it, in conjunction with a communicator, but that’s like carrying an iPad and a 3G hotspot and a phone all at the same time. That’s an awful lot for Keiko and Molly to carry on their camping trip to Andor just so Miles can see his daughter before bedtime. Evo: I haven’t really gotten Qik to work well yet — I think it requires 4G-like speeds to be at its best — but I have facetimed with my dad using it. It’s not like when the captain is talking to Admiral Nechayev in the ready room, but we’re getting there. Communicator: When you’re wearing it, the ship knows exactly where you are. But you can’t ask it to give you directions to the nearest Jumja Hut. Evo: Turn-by-turn directions, multiple mapping applications, and you can be tracked by the internal GPS chip. So, in ten total categories, the Evo wins in eight, the Communicator in one, and they tied in one. The commbadge isn’t looking so great now, is it? Look, I know that most of the stuff I’m talking about in this article didn’t exist in the 80s and 90s — cameraphones, social networking, texting, personalized GPS units, and apps. And I’ve written about how fast sci-fi has to change because actual technology is changing faster than ever these days. But I found it pretty amusing that, with only a couple of exceptions, my new cellphone (and, for the record, my old one, which was just an iPhone 3G that I’d had for more than two years) is a far better device than the Star Trek communicators of the TNG era. Unfortunately, I can’t tell it to call the Enterprise and beam me up, but as Shatner once said, “I’m working on that. For the record, I really wanted to call this post “I Beep My Communicator Back and Forth”, but it didn’t make any sense. Oh well. Also: no monetary compensation was received by anyone from Sprint or HTC. I just wrote this because I thought it was funny. 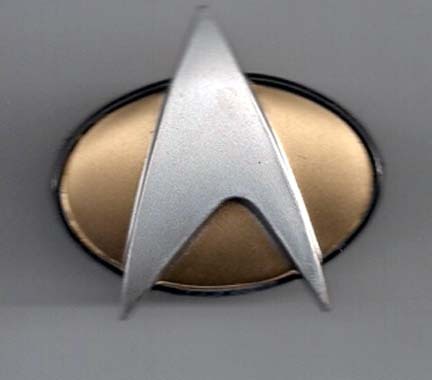 * For the sake of argument, I’m going with the TNG/DS9/VOY combadge units, rather than the pocket-comms of the TOS/ENT era. Also, except where noted, I’m sticking to what was shown on TV, because if you believe the novels, the little arrowheads can do almost anything.